Support HCHC with a financial gift. Every gift, no matter the size, makes a difference in the lives of our students. Share HCHC publications and communications with parishioners. 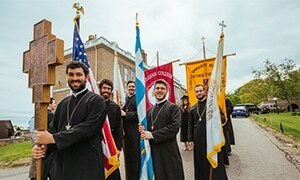 Pray for Hellenic College Holy Cross. To learn more about the projects that your contributions, good will, and prayers will aid, please contact the Office of Institutional Advancement.